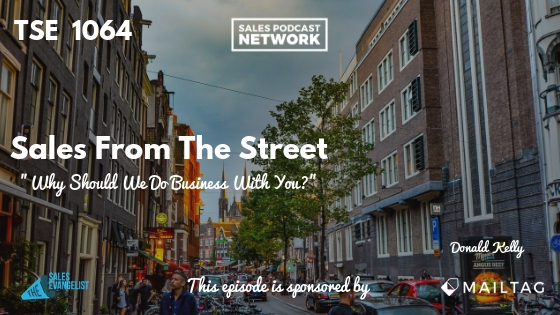 TSE 1064: Sales From The Street - "Why Should We Do Business With You?" One of the most important questions you’ll answer is “Why should I do business with you?” and it’s vital that you get it right when you do. When the question comes, you’ll be tempted to point out how long your company has existed, how great your product is, and how great your customer service is, but those answers won’t likely work. 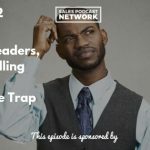 Sales From the Street tackles actual problems that sellers are facing and allows a sales rep just like you to provide an answer that worked for him. People frequently get on Reddit seeking advice about how to answer this question. I love checking in there because it gives me a great opportunity to connect with sellers and share my own insights and expertise. They frequently listen to the podcast after our interaction and it presents a great opportunity to grow my business. If you haven’t checked Reddit for a page related to your own industry, you definitely should. “Why should I do business with you” is a loaded question, and I’m going to answer it in two different ways. 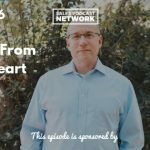 When I was a young seller, I was quick to point out the features of my product and to preach about why we were the best company, but it never addressed the client’s true issue. Your answer to the question will largely depend on whether this is the first time you’ve spoken to this person. Do you have a relationship already, or this your very first contact? If you’re speaking to the customer for the very first time, he may be testing you to see how you’ll respond. You could play a seller’s version of whack-a-mole and blindly try to guess the right answer, but as a sales professional, that’s not how you want to operate. Instead, take control of the situation. Your first priority should be to find out why she is asking this question in the first place. “You know, David, when people ask that question it’s usually one of three things. Testing whether I’m quick on my feet. To determine whether we can solve their problem. His answer to your question will help you understand how to proceed. Ask questions about the sales process that will help you determine what the customer is seeking. Take charge of the sales process by controlling the conversation. If the prospect is wasting your time and has no intention of hiring you, you’ll determine that more quickly rather than wasting time on a deal that will never close. If the prospect is interested, he’ll answer the question and you can continue from there. Pose a question in response to his question. Ask him why he’s inclined to ask that. If he indicates that his company has encountered other sellers who couldn’t solve its problems, then you’ll know how to respond. You can even mention at some point that you’d love to be honest enough to acknowledge if the two of you aren’t a good fit. That will keep you on the same page. Your customer expects you to rattle off a list of features and benefits. They expect you to be a submissive seller. They may not realize that as a professional seller, you’ve helped a lot of people, and you’re an expert at doing so. You’re going to stay calm and confident. If, on the other hand, this is a customer that you’ve worked with for some time, he may be truly trying to determine whether he should work with you. Your goal is to communicate to him that you’re the best at solving his particular problem. You’ve done it for thousands of other clients, you’ve run the protocols, and you know you’re the best. You can turn the tables on the customer at that point. Be confident. Make sure you understand why the customer is asking the question.